With tens of thousands of inexpensive individual varieties, United States precancel stamp collecting offers an endlessly fascinating, endlessly affordable pursuit for new and experienced collectors alike. Although seldom seen in use today, precancels were used extensively by large business mailers for much of the twentieth century. As their name implies, precanceled stamps are stamps which have had their cancelations applied prior to entering the mailstream - and prior to being affixed to envelopes or packages. The vast majority of these cancels are easily identified by their distinct, uniform appearance featuring the name of the city and state between two parallel lines. The use of these stamps offered several advantages. Precanceling stamps in full sheets, or even as part of the printing process, saved the Post Office significant time and labor when processing the mail later. In addition to the promise of having their mail delivered more efficiently, large mailers were offered discounts for using precanceled stamps, presorting, and otherwise preparing their mail for easier handling. Business mailers were also afforded a measure of security in using precancels. An uncanceled stamp is basically an untraceable cash-equivalent, and businesses that kept large numbers of stamps on hand needed to worry both about minor pilferage for personal use as well as larger scale thefts for resale. Stolen stamps would have been of little use to thieves and very difficult to sell because their use was restricted to large mailers and required a permit at the Post Office for which the stamps were marked. The early history of precancelation can be a little murky. As collectors, we are accustomed to the availability certain bits of historical philatelic data such as stamp production numbers, postal rates and other relevant regulations. In contrast, precancelation emerged as practice slowly over time and was in use for decades prior to any official regulations and record keeping. It is known that the idea of precanceling stamps dates back to the very beginning of using stamps as prepayment of postage. The earliest documented United States precancels are the 1844 Hale Locals. They were the product of Hale & Co. one of many private postal services that operated in this country until they were shut down by act of Congress in 1845. The cancels consist of horizontal and vertical black pen markings. They are identified as precancels by examining existing copies on cover (affixed to envelopes). The markings extend to the edge of the stamp but not to the envelope itself, providing evidence that the cancel was applied to the stamps in a sheet prior to afixxing them to the cover. This method of examination is significant in the identification of such early uses which often cannot otherwise be distinguished from postcancels. The period between 1844 and about 1880 is generally referred to by collectors as the Pioneer period. During this time there was no uniformity in approaches to creating and applying the cancels and they exist in myriad forms which include simple pen strokes, handwriting, grid patterns, the word PAID, circular city and date stamps similar to conventional postmarks, and simple city and state markings which foreshadow the regimented appearance of 20th century cancels. The Glastonberry G. from the Glastonberry, Connecticut Post Office is one of the most famous of the Pioneer cancels. Some other notable Pioneer cancels are the Glen Allen Star from Glen Allen Virginia, the New York Pearls which were applied to postage due stamps in New York City, and a variety of city name types from Cumberland, Maine. For the remainder of the 19th Century and the very first years of the 20th, the practice of precanceling became more established and some definite trends in format began to emerge. Precancels of this time can be roughly broken out into two categories. Some cancels, generally termed bar cancels, were made up of bars, lines or other geometric pattern without a city reference. Bar cancels were created by a great variety of methods including printing, handstamping, pen, stencil, and even crayon. Although the patterns of many bar cancels are distinctive and recognizable as precancels, it is frequently only possible to positively identify them as such when you are fortunate enough to be able to examine them on cover. A second category of precancel to emerge in the late 19th Century is usually referred to as the Transitional precancel. Transitional precancels were typically ornate, frequently oval or circular, and included the city and state of the issuing Post Office. Between their ornate nature and the inclusion of the city and state, Transitional cancels are usually much easier to positively identify than the Bar cancels of the same period. The year 1903 was a pivotal one in the development of precancels when for the first time United States postal regulations specified that precancels consist of the city and state printed between two bold parallel lines. Universal adoption of this standard actually took a number of years, but by 1910 virtually all precancels conformed to the regulation. The period between roughly 1903 and 1922 is the Classic period. This period is characterized by diverse yet increasingly uniform cancels applied to the rich variety of Washington-Franklin stamps in production at the time. In 1913 the Post Office Department took another step toward standardization, giving individual Post Offices the option to obtain precancel devices from a national headquarters. Initially two styles were available: a metal plate called an electroplate, and a rubber handstamp. From this point on, collectors distinguish between precancels applied with these standardized devices - called Contracted Devices - and those printed using devices purchased by local Post Offices from local vendors - called Local Devices. As the use of precancels exploded, pressure mounted on the Post Office Department to develop more efficient and cost-effective methods of producing precanceled stamps. In 1916, the Post Office Department contracted with the Bureau of Engraving and Printing to precancel 4,000,000 stamps each for the cities of Augusta, Maine, New Orleans, Louisiana, and Springfield, Massachusetts. These three issues are referred to as the Experimentals, and although it would not be until 1923 that the Bureau of Engraving and Printing would produce additional precanceled stamps and ramp up to full production, the era of the Bureau cancel had officially begun. The entry of the Bureau into the precancel business was a game changer in a number of ways that are significant for collectors. Being mass produced in a single location, Bureau cancels continued the trend toward uniformity that began with the regulations of 1903 and the supplying of contracted devices in 1913. Perhaps more significantly, the Bureau precancels were fully in the realm of official Post Office Department products which meant that production numbers were maintained and were a matter of public record. 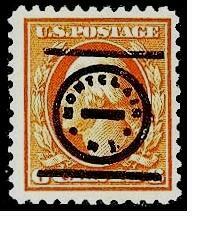 The first order delivered by the Bureau was to New York City for 20 million 1 cent stamps. 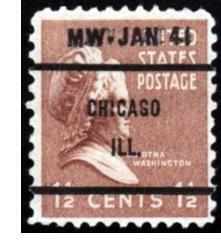 Originally, Bureau produced precancels were only available for stamps in sheets, but in 1924 the service was extended to coils. Minimum quantities at that time were 500,000 for sheet stamps and 250,000 for coils. It should be noted that local production of precancels continued throughout the modern period. Referring back to the discussion of Contracted and Local devices we now have three broad categories of cancel: Bureaus applied at the Bureau of Engraving and Printing; Contracted Locals applied at the local Post Office using a centrally supplied device, and Locals which were applied at the local Post Office using a device procured locally. By 1923 it would be fair to say that the formative history of the precancel was complete. There were of course noteworthy subsequent developments. In 1927 the Bureau adopted the significantly smaller typeface that produced the two and three line formats that collectors call the "standard types" and that are the image most commonly associated with United States precancels. In 1938 Postal Regulations specified that precancels with denominations of 7 cents and higher must include the user's initials and the date of use. In 1978 Bureau precancels became lines only with no city and state listed, eliminating the need for Locals because Bureaus could be used at any Post Office. In 2007 the United States Post Office ordered the destruction of all local precancel devices. Throughout the modern precancel era there was significant variation in both Contracted Devices and Local Devices as vendors changed and technology advanced. Note that the term "subject" as used below refers to the part of a device that precancels a single stamp. Electroplate - A metal plate used in a press found in both Contracted and Local devices. Usually contains 100 subjects. Electroplates tend to produce a sharp strike with dark, uniform inking. Typeset - A Local Device made with set type or linotype slugs and applied with a press. Typeset devices usually produce a high quality print and like electroplates have dark, uniform inking, but exhibit greater variation among subjects as each subject on the device is setup individually. Mimeograph - Precancels printed locally using a small printing press that works by forcing ink through a stencil onto paper. As the stencils were made with standard typewriters, the typewriter characters on mimeograph precancels make them fairly easy to spot. City-Type Coils - Contracted Devices designed to apply cancels to rolls of coil stamps. Rather than a flat plate, the device utilizes a wheel turned by hand. Common in the early part of the 20th century and then seldom seen. It was understandably difficult to align these cancels with any precision. Therefore City-Type Coil precancels are vertical and applied in a continuous stream with portions of two or three subjects appearing on a single stamp. Handstamps - Handheld devices used in Post Offices where only small quantities of precancels were required. Over the years the Post Office supplied three types of Contracted Handstamps. Rubber stamps were supplied until 1932, metal stamps were supplied from 1932 to 1958, and from 1958 onward Contracted Handstamps were vinyl. Local Handstamps were made from a variety of materials. The nature of the devices themselves and the method of application makes for a wide variety in the precancels which are very uneven in their inking and orientation, and often show excessive wear and distortion. Integral Devices - Local Devices in which the impression includes the permit-holder's initials, the date, and the precancel. There are both Integral Handstamps and Integral Typesets. Note that not all precancels with dates and initials were produced by Integral Devices. As with any collecting pastime, there truly is no "correct" way to collect and organize precancels. It would be virtually impossible to assemble general collection of all existing cancels on all the stamps to which they were applied - the number is in the millions. Nonetheless, many collectors are content to simply acquire as many different combinations as they can find. Beyond the general collection, opportunities for specialization abound. 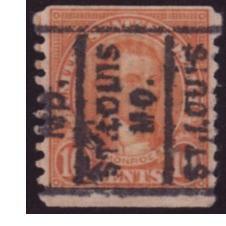 Some collect only Bureau Prints, others pursue a particular state or city, and still others collect cancels made by specific devices. One particularly popular specialty is to collect one precanceled stamp from every town that has ever issued them. Precancel collecting brings some challenges. There are few dealers who specialize in precancels, but fortunately those who do tend to be passionate collectors themselves. Often precancels are simply mixed in with general used U.S. stock, leaving collectors to sift through red boxes at shows and online inventories - time consuming of course, but with rewards for the diligent. The quest for quality takes on new dimensions in precancel collecting. In addition to soundness and centering of the stamp itself, collectors naturally want a strong, clean, well-centered cancel. While Bureau prints tend to be of high quality, with locals the quality of the cancel varies greatly. There are times when a nice copy of a needed item simply is not available. Experienced collectors know that there are times when it is best to accept a less-than perfect stamp rather than run the risk of never seeing the opportunity again. The Precancel Stamp Society can prove to be an invaluable resource for collectors. The Society's website www.precancels.com has information on getting started, back issues of the "The Precancel Forum," links to dealers who specialize in precancels and more. The Society also publishes a series of catalogs available in both print and computer software format.